Floor and roof truss systems offer several key advantages to builders of custom homes in Calgary. 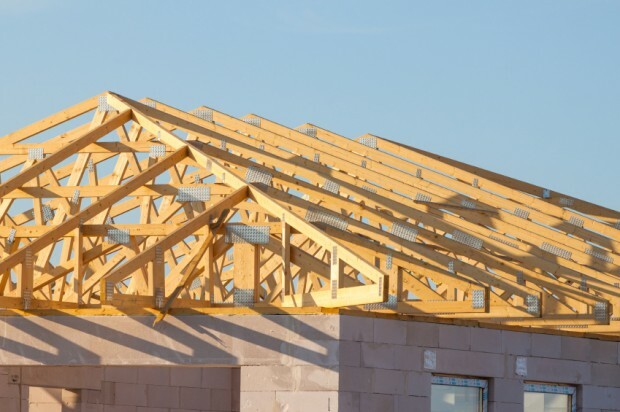 Trusses are triangular structures that use straight joints connected at panel points to create a strong, durable and fundamentally sound underlying support system. A wide range of performance characteristics, which make trusses an excellent choice no matter what type of home you’re building, supports their inherent structural superiority. The most common floor truss system is what is known as an “open web truss system.” In an open web truss system, joists are attached to flat top and bottom support panels called “chords.” Its name comes from the open design that results from construction. An alternative to the open web truss system is the engineered joist system. Also known as all-wood trusses, engineered joist systems use supporting sections to add strength to a series of interlining joists. When viewed at a cross-section, both open web and engineered joist systems connect a series of triangular supports to the flat panels that make up the top and bottom of the truss. Noise reduction. Truss systems absorb sound vibrations from both above and below, so you’re less likely to be disturbed by the sound of someone walking overhead or watching television in the room directly below you. Enhanced flexibility. If, for example, you decide to convert your attic into a loft, having a floor truss system will allow you to make just about any reasonable modification to your home without the need for added structural support at floor level. Better plumbing and wiring connections. Because truss systems are essentially open designs, it is very easy to run pipes and wires through them. This can dramatically reduce the cost of major repairs, should they ever become necessary in the future. Stress reduction. Trusses are very strong, which helps your home maintain its structural integrity for a longer period of time. Open web systems are generally considered to have better overall span capabilities than engineered joist systems. However, engineered joist systems have superior load-bearing capacities, so they may be a better option if your floor is meant to support a large number of heavy objects. Trusses can also be used in roof construction. They have an unusually high strength-to-weight ratio, meaning that they maximize your roof’s load-bearing capacity while adding only a relatively small amount of weight to the overall house structure. More and more custom homes in Calgary are taking advantage of roof truss systems because they facilitate the installation of superior insulation as well. Roof trusses create extra space between your attic ceiling and the roof of your home, which you can leverage to create a superior barrier against thermal transfer. By packing this space with the right kind of insulation, you can effectively neutralize the penetration of outdoor air and the escape of conditioned indoor air. This approach also opens up the possibility of placing all your roof insulation in the truss cavities, preventing the need to install a supplementary outboard insulation layer. Another advantage of roof trusses is that they are better able to support custom home designs. They are among the most flexible options in terms of roof structuring, and are highly recommended for applications involving alternative floor plans and home layouts. Custom Homes Calgary: Why Choose Fine Line Homes? Fine Line Homes is a leading Alberta-based builder of smarter, more efficient houses. The Fine Line design and engineering professionals use advanced technologies and state-of-the-art best practices to help your home perform better and use less energy without compromising an ounce of comfort. Because our homes offer superior efficiency, they often have higher resale values when compared to comparable standard-built alternatives. We support our clients through every step of the home building process, from securing financing and settling on a floor plan to interior features and decorative strategies. We also aim to debunk the myth that custom homes are expensive. In fact, we can build a custom home to suit just about any budget. If you would like to learn more about our company and the beautiful, luxurious and intelligent homes we build, please visit us online to register for your complete home information package.